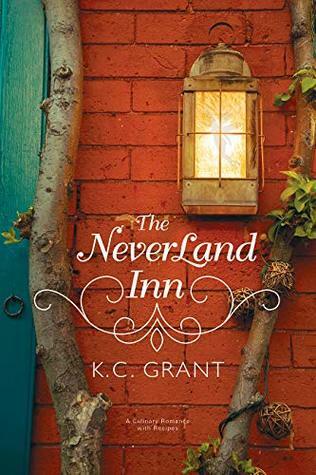 The Neverland Inn by K.C. Grant. First off, this book should come with a warning! Do not read when hungry! The first chapter had a description of the textures and cooking a meal and it made me salivate! It sounded so good! Several times, I got up to see if I had the ingredients to make that recipe listed here or there! I could just taste everything the author described!!! I did end up putting the book down so I could eat! Otherwise I would have never finished it! Daniel seems very frustrated with his life. He is living what his parent’s expectation of his life should be! He has a gorgeous fiance. He is in his father’s law firm and is expected to be a partner some day! There is no time for happiness or doing what you want to do in life. So, when his grandmother dies, he goes to take care of the estate. He loved his grandmother and she was the only one who let him be a boy and loved him unconditionally! When he gets there, he decides to stay for a day or two extra. He just needs a break. But when the hotel has no rooms for the extra days, he books a room at the Neverland Inn. When he goes out to the town to eat, his car is towed and he has no choice but to rely on Sarah to get him back to the Inn and wait for the owner of the compound to open up. While Daniel can be frustrating, he warms up to Sarah and her town and relaxes for the first time in forever. Sarah believes in people, her town, and her magical Neverland Inn! She loves to cook, caring for people and helping out her friend who teaches special education. She thinks she can help Daniel relax and when he does, they begin to see each other in a different light! Where I loved the story, I didn’t really feel the chemistry between the two. Maybe it’s just me! If you like stories with the innocence of children, head injuries, believing in people, grandmothers, aunts, lawyers, teachers, recipes that make you salivate, then this might be for you!! K.C. Grant loves to write! From bad poetry at the age of seven to not-too-much-later attempts at a novel where the main character was a talkative red-haired girl (yes, that wasn't very creative) she has loved to create stories. 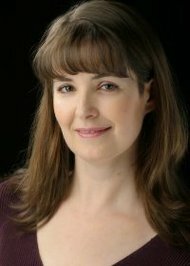 In her adult career, she has written for family oriented magazines like BackHome, Parents and Kids, The Washington Family and LDSLiving. 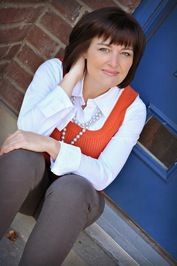 She was so excited about the release of her first novel in 2010, "Abish: Daughter of God." A sequel, "Abish: Mother of Faith" continues the story of Abish and focuses on the mothers of the stripling warriors. 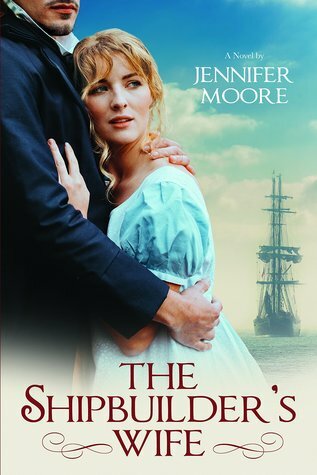 The Shipbuilder's Wife by Jennifer Moore. I am so glad I didn’t live in those times. No air conditioning, no cars, war in my backyard, and the marriages of convenience or for reputation or just because with their being no affection to begin with. I admire Jacob Steele for marrying Lydia. He is a very good person and yes things work themselves out in the book. But it still is a rough road. You have to learn to trust this person and be able to communicate. And then there is everyone's doubts and fears, and these two have some! I love how they work things out! I love how the book ends. I love the talk on the care of the wood on the ship and in Jacob’s home. I love when something that is made is very carefully crafted and loved! I also enjoyed the fact that I grew up in Maryland and know where all these places are and have visited them. I am sure it was much more forest in those times than all that I grew up seeing. After all, I ate at a McDonald’s last time I was in Bladensburg! And I love the view on the Potomac River and the Chesapeake Bay. But it is really cool to be able to see everything clearly in my head! I think Jacob and Lydia are definitely made for each other. They are yin and yang! Jacob is a large looming man who once was an orphaned child who protected the other children and watched them all find homes accepting him and his best friend Alden, His fear is to be alone. But he is afraid to make a stand with Lydia when things go wrong. He just goes back to closing his heart and just silently accepting it. Lydia gives him options several times but they come out as statements and if Jacob continues to do nothing he will lose her. There are a few very tender moments when Lydia is attending to him and she often worries about him. But Jacob is a fool and doesn’t know what to do with his own words!! And I loved the little trivia at the end. You really should read it! It is a wonderful adventure! I think a book about Alden will be coming next?? I will definitely be reading that one! Alden cracks me up. He knows how to talk to anyone and he is a natural at it! There is only a hint at something that has happened to him in the past and I want to see him happy and married!! 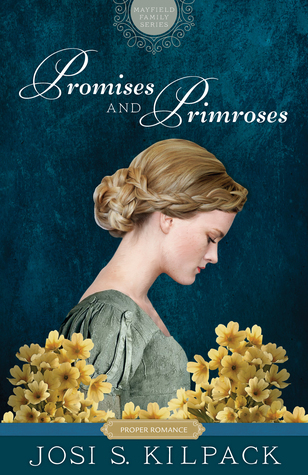 Promises and Primroses by Josi S. Kilpack. Publication: September 4th 2018 by Shadow Mountain. In the back of the book are questions to reflect on. It is always interesting to read them and find things I hadn’t thought of while reading the book or finding a different take on it. I appreciated that there were 2 couples in this book. One older and one younger. Time changes things for older couples. Peter is a very honorable man. He will do anything to keep out of the scandal that the rest of his family (excluding his uncle Elliott) seems to thrive in! He has worked hard. He has a new hobby of raising and breeding dogs. He is still a little new at it. His wife died several years ago and while he still loves her memory, he hasn’t moved on. He doesn’t think he should nor does he have the time. He has 2 well behaved children who do child like things like jumping in the mud or running and sometimes arguing with each other. What kid doesn’t. Peter knows to let them be children for awhile and correct them respectfully and lovingly. Julia applies for the governess position in Peter’s home. She wants to live her own life and make her own decisions but her mother, Amelia, seems to try to interfere to have her try and find a man to marry and have children with. We learn more about Amelia and follow her story too. Julia is 28 years old and is resigned to a life without children of her own. She is happy serving others. Julia is kind, sincere and polite. She misses her father who raised dogs and showed her all there is to know about them. When Julia goes to the interview in the beginning of the book. I was reminded of Goldilocks and the Three Bears. There were 3 applicants that day. The first one was a bigger woman, the second one was a small woman with a seriousness to her and then there was Julia who was just right for the job! Hehe! But at first, Peter did not pick her. She rattled something in him. He found her attractive and he didn’t like the feeling one bit. So she is in the hallway and witnesses Peter tell the (what do you call a person who finds people for a job) man that he will hire the second woman. Peter looks at her but doesn’t say one thing. Well that choice was absolutely horrible in more than one way! In the end, Peter has no choice but to hire Julia. And she turns out to be just perfect for his children and household. But of course, we all know this!! All along, his two closest family members see the budding relationship in them. But Julia doesn’t see it yet. Yet she admires him. Julia is kept in the dark about a lot of things. Peter can’t handle his growing attraction to her. His parents were a scandal and he doesn’t want to be like them. But you can’t stop your heart from loving who you love. Julia’s mother wants her out of the home and Peter will turn her out as soon as he finds another governess. Then, per one of her family’s request, has a dinner party with Amelia and Uncle Elliott and his other family member who is now married who used to be the governess. Let Amelia see the household and that it is a good home and honorable. Amelia only sees red. She used to love Elliott long ago and he left her so she thinks that is the way with all the Mayfield men. Julia doesn’t know why her mother and her were invited to dinner. Any way, I love how this story unfolds and how past things are corrected and how others communicate and how love blooms not for just one but for 2 couples. I love the meadow full of primroses in the book. I had to look them up so I could see what they really looked like. Yes I know they are on the front cover but I wanted to see what they looked like in real life! I wonder who will be next in the family to get a book. In the beginning there is a geneology line written out. And Elliott has a campaign to find acceptable spouses for his nieces and nephews. Upon that marriage, they will receive an inheritance or gift. I loved the one bestowed upon Peter! If you like flowers, dogs, honorable men, overcoming family scandals, riding on a horse for 50 miles, parents mistakes, second chances, finding love again, being your own person, communicating, than this might be for you! !